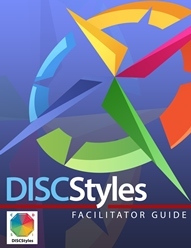 The DISC Styles Assessment Leader Guide contains all the information you need to run an effective an engaging DISC session. The opening pages of this Leader’s Guide provide you with an overview of each program option—the half-day (4 hours) and the full-day (7.5 hours) as well as preliminary information you will need. Following these pages are The DISC Presentation Outlines for both options. The outline is in three columns: Activity, Full-Day, and Half-Day. 1. The Activity column tells you at a glance what is next in the presentation. 2. The program outline shows the time for presentations and activities given in a full day session, and gives the page number in the Leader’s Guide containing the information the facilitator needs to conduct the activity or presentation. 3. Although guidelines or “scripts” for conducting activities and/or presentations are provided, you still must prepare for the session in advance! Don’t expect to just wing it and get great results. You will want to customize the script by including your own stories and examples or making key points that are particularly relevant to your participants.